I'm making this tourist attraction based in something I saw sometime ago in a pixel art forum. It's a pair of aliens that have had an accident. The army is the first to arrive there. It'll be desert climate only. Mulder and Scully have copyright so I didn't have more options..in earlier sketches, there was an army helicopter, but I remove it because it took a lot of space. It's based on Roswell incident. "Where is the tourist attraction you said? I'm not seeing any. By change, has it been abducted?" I've updated the preview. Now the aliens glow, the impact crater is more dirty and I've added the desert ground texture. I've corrected lights position, too. Are you aware of the fact that you can cut the two aliens from base image, put them into FrontImage=*blahblah and have them glow whatever color you choose, apart from the special ones? Or at least theoretically it should be possible. I think this add-on would fit better in pak96.comic. :-\.... I'm not sure. It has no comic style, but is true that it's quite informal. Let me finish it and we'll see. It reminds me of some graphical errors I had when I made future.pak and the saucer ship flew through some buildings. I know. I know that graphic style is not a comic's one. But I was talking about its theme. Well, this might demostrate that we're not alone in Simutrans world.. Yes, I knew what I was going to hear even before I clicked - hell, I was actually already whistling it, before I clicked. While I finish the UFO incident, I have time to create this Poseydon temple. The design is not mine, is from a pixel-art website. I used GIMP to create the water effect, but the final version will be in 3D. I have to fix some textures and add a fence, too. UFO incident, renamed to Close Encounters of the First Kind, finished... Its chance and passengers level are not very high, therefore it won't be very common. I don't want to see any alien invasion in Simutrans.. Yes, although we might need poseidon's help, sometimes, for an extension request made before, IMHO. We already know that we're not alone in Simutrans universe, but now it's time to put in contact with them. That's the reason why SimuSeti project was created, and this is its radio-telescope, called "The Big Ear". 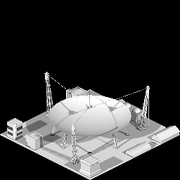 It's based on an addon I saw at Simcity forum, but adapted to Simutrans. I've to fix the scales and add the details to buildings (windows, roofs, etc..) and ground (trees, people, roads, security fences, etc..) but until now, the result is better than I expected..
Is similar to that in Brazil. I have bad memory jijiji, this excellent your addon..
And the "big ear" radiotelescope it great, too! Another work in progress: Kingsbrigde Cathedral from the famous novel "Pilars of the Earth"
Sounds like a good idea. 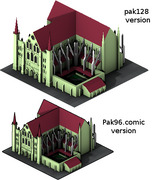 The old image never really fit well into Simutrans, and the new cathedral will be a nice replacement. the idea of having photorealistic images never really took off, better to go with the style that most existing buildings have. 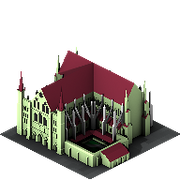 I'm still working on details of the Cathedral, meanwhile I've done these size tests for other paksets. WOW great. You are a master! What do I have to pay if I need a few industries? Thanks for the praises. I'm glad you like it.. It will be free because I have a lot of industries in my to-do list, and probably all will be included in the future pak64.industry pakset I'm working on with Rainer and some people more. That's good news I have ideas for one or two more industry chains for pakHajo.Evolution, and I'll need some factories and shops, so there is hope to be able to borrow from your work once ready. Well, right now we are just making plans. Then, we surely ask for suggestions.